The perfect add-in for smoothies. 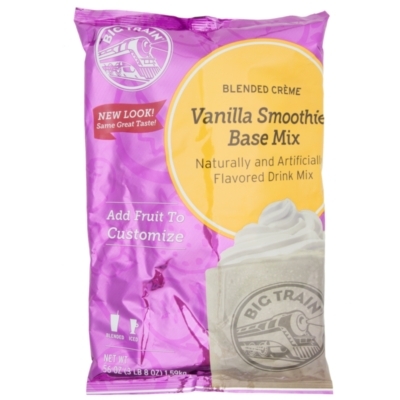 Big Train's Ultimate Smoothie Mix is a lightly flavored vanilla powder that can be blended with fruit juices, fresh fruit, milk and ice to create a perfect smoothie. Works as a substitute for ice cream and/or frozen yogurt. Each 3.5 lb. bulk bag makes 51 - 8 oz. drinks. Buy five bulk bags of Vanilla Smoothie Mix and save even more per bag.